Late last week I pitched an article about the Chiefs. Heading into Week 11, they had won five straight and were in line for the AFC’s No. 2 seed. But, I proposed to question, are the Chiefs actually any good? 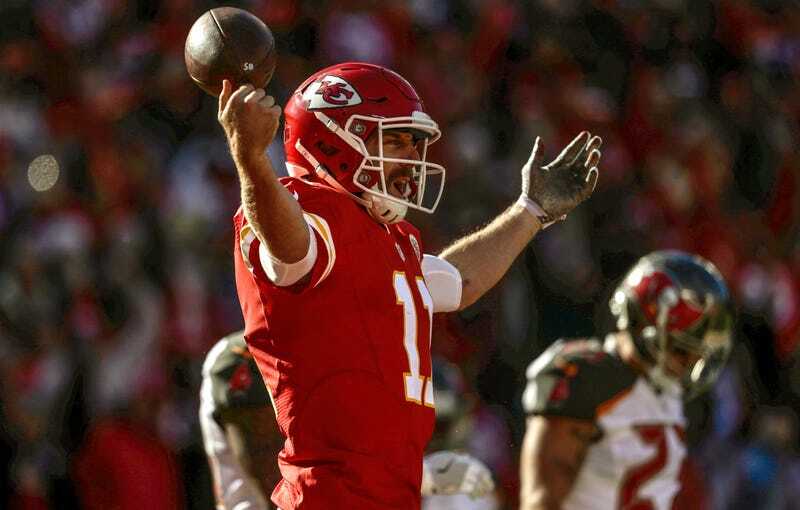 The response I got from an editor was to wait to see how the Chiefs did during Sunday’s home game against the Buccaneers. So it is, after Sunday’s 19-17 loss to Tampa Bay. Now at 7-3, Kansas City would still qualify for the postseason if the playoffs were to begin today, which of course they don’t. But until Sunday, the Chiefs had been bending without quite breaking for a while by beating bad defenses, winning despite some meh performances (even for him) from Alex Smith, and struggling like hell on both sides of the ball in the red zone. And what’s left of their schedule is a gauntlet compared to what they’ve already faced. The Chiefs’ most striking statistical advantage has been their plus-13 turnover differential, which is tied for the league lead with the Vikings. Kansas City’s defense has indeed bailed out its offense—two fourth-quarter takeaways led directly to 11 points in an astonishing comeback win at the Panthers in Week 10—but a closer look at the Chiefs’ takeaway ratio reveals it to be somewhat hollow. Kansas City was plus-7 against the Jets because Ryan Fitzpatrick spent the afternoon playing catch with its secondary, and it was plus-4 against the Jaguars, who are the Jaguars. In four games this season, the Chiefs have actually had a negative turnover differential. They lost three of them. 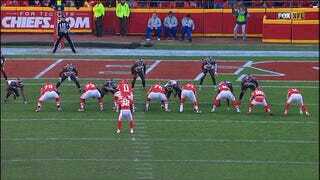 Despite all that, the Chiefs’ offense has muddled along. Injuries have kept Jamaal Charles off the field for all but 12 carries this season. Spencer Ware (4.9 yards per carry) has done a good job in Charles’s place, but the team remains just 25th in rushing DVOA. And Alex Smith hasn’t been able to lift the offense to any real heights. Per Pro Football Focus, Smith has completed just eight passes that have traveled 20 or more yards in the air; that’s to be expected, given his lack of arm strength and Andy Reid’s reliance on a quick-strike system. Smith’s top target is tight end Travis Kelce, who has 19 more catches than anyone else on the roster (though wideout Jeremy Maclin has missed time with a groin injury). And while Smith has been pressured on just 26.3 percent of his dropbacks, according to PFF, his passer rating is a rather dreary 66.4 when he does see pressure. The Chiefs find themselves heavily reliant on their pass protection, which makes them eminently vulnerable to any team with a decent pass rush. The Chiefs are terrible on third down (a 35.6 percent conversion rate, which ranks 25th) and they can’t find the end zone once they get inside the 20. Their red-zone conversion rate is a sickly 41.2 percent, which ranks 31st in the league, ahead of only the woeful Jets. Here are a couple of examples of that red-zone futility and uncreative playcalling. The first clip shows three straight plays against the Panthers. On the first, Smith just doesn’t see a wide-open Kelce; on the second, he badly overthrows Chris Conley; and on the third, TE Travis Ross drops a ball that wouldn’t have gone for a first down anyway. Smith’s flaws as a passer have been exposed in large part because defenses aren’t allowing him to scramble or to run like he used to. Last year, Smith ran for 498 yards and 5.9 yards per rush. This year, he’s on pace for just 74 yards on 37 attempts. In short, Smith can’t stretch the field consistently with either his arm or his legs. It’s a problem. Back to the defense: The Chiefs’ unit is ninth in DVOA, but just 19th in run DVOA, and it can’t get off the field on third down; teams have converted against them 46.7 percent of the time, the third-highest total in the NFL. (The Bucs were a devastatingly effective 11-for-16 on third down on Sunday.) Edge rusher Justin Houston finally played for the first time this season on Sunday, but Marcus Peters, a playmaking cornerback whose 13 interceptions since the start of last season leads the league, has been bothered by a hip pointer. And another edge rusher, Dee Ford, sustained a hamstring injury on Sunday. Ford’s 10 sacks are tied for the league lead, and his pass-rush productivity (per PFF) of 11.1 ranks 10th among 3-4 outside linebackers. The Chiefs still have to face the Broncos twice, plus matchups against offenses like the Falcons (1st in DVOA), Raiders (4th), and Titans (7th). Their 7-3 currently record gives them a one-game cushion in the race for a wild card. But the real question might not be if this is the season the Chiefs are capable of a deep postseason push, but rather whether they’re a playoff team at all.